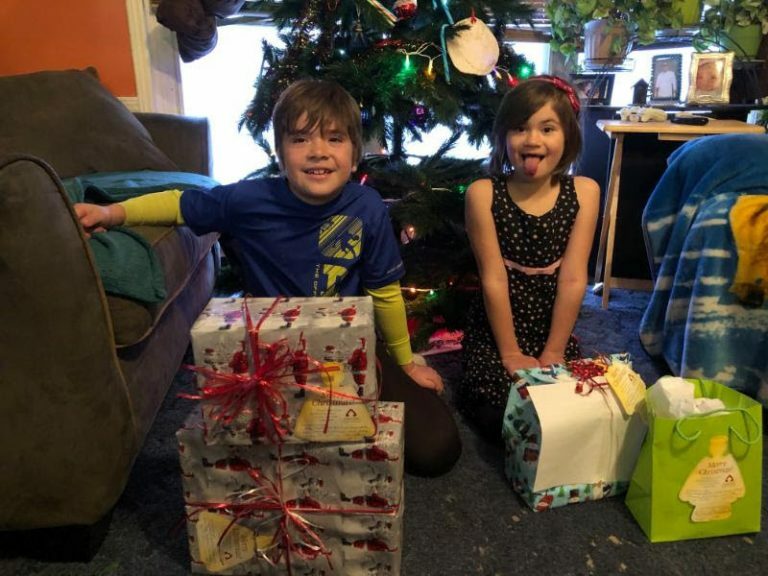 Two children in Rothsay, MN, look forward to opening their Angel Tree gifts. This Christmas season Servant Branch members drove 2,640 miles to 23 different towns, many of them hundreds of miles from the Twin Cities, delivering Christmas gifts to the children of prisoners. They went to places like Karlstad, Minnesota, a town of fewer than 1,000 people near the Canadian border and some 350 miles northwest of the Twin Cities. (The trip took two days.) In total, seven teams of drivers crisscrossed the northern half of the state and even dropped some gifts in South Dakota. The effort is part of Project Angel Tree, sponsored by Prison Fellowship International, whose mission is to deliver presents to children on behalf of their incarcerated parents. A brief note from the parent accompanies each gift. Servant Branch members have helped out for 35 years running, and they’ve earned a reputation for going wherever they’re needed. “I’m very impressed with People of Praise,” said Gayle Foster, who coordinates Project Angel Tree’s effort for an eight-state area. “They are willing to go the extra mile literally to help out”—traveling to towns where Angel Tree does not have any local church partners. 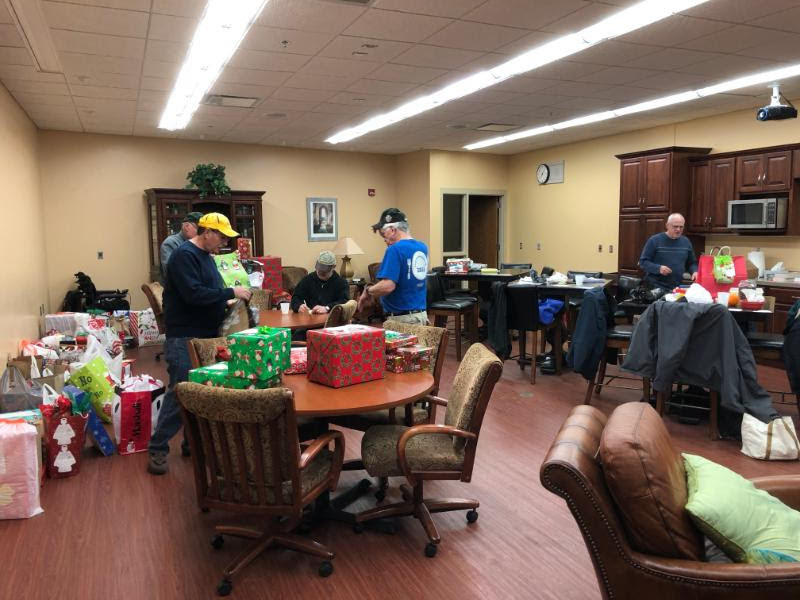 Brad Bye’s men’s group sorted and packaged Angel Tree gifts by family in the family room of Servant Branch’s River Ridge building. More than 150 branch members joined the effort this year, says Bob O’Connell, who has been the driving force behind the branch’s efforts since the start. Their work included calling families to get gift recommendations, shopping for gifts and making baked goods. Jim and Norma Cahill negotiated with local grocery chain Cub Foods to procure turkeys for some of the larger families. Bruce and Charlene Olson, the owners of Truestone Coffee Roasters, donated 48 one-pound bags of coffee, while others donated money. Each child received at least one gift along with one clothing item and a Bible in the child’s native language. (The Bibles come from International Bible Givers in Anoka, Minnesota.) Families received a warm blanket, coffee and baked goods, while families with three or more children also received a turkey. There were plenty of frustrations as well as laughs along the way. When Bob Krause and Brad Bye reached their last stop in Hibbing, Minnesota, they realized that they had accidentally dropped off the gifts intended for the family in Hibbing to a family in Chisholm, Minnesota (about seven miles away). They returned to Chisolm, swapped out the gifts, and made their way back to Hibbing! Bob O’Connell has many moving stories from the past 35 years. He remembers one time when a branch member called a woman who was caring for a young boy and girl to find out what kind of gifts the children would like. In conversation, the caller learned that the children, ages seven and nine, had been sleeping in the same bed because their caregiver did not have the money to buy an additional bed. The woman said she had saved up some money for a secondhand bed, but it had sold before she could buy it. The caller told Bob about the woman’s situation and together they spread the word among branch members. Someone donated a bed and they took it to her along with the Christmas gifts. She was stunned and delighted. Another time Bob delivered a turkey to a grandmother, who walked Bob into her rundown kitchen and opened her pantry to show him one can of green beans—the only food she had. She said that, if not for the turkey, they would have had nothing but the beans for Christmas dinner.